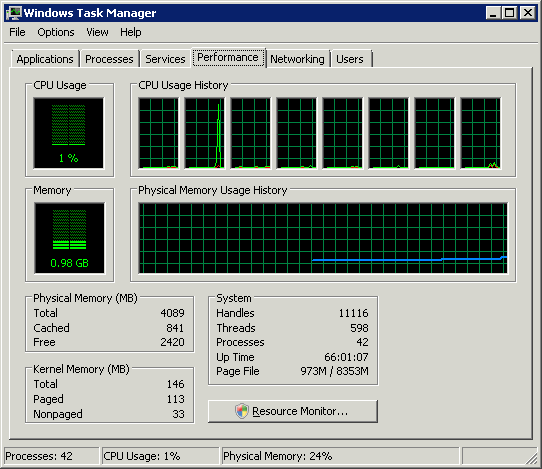 The Windows Server 2008 Task Manager provides an instant view of the system’s resources, such as memory usage, process activity, processor activity, network activity, user info, and resource consumption. However, there are some significant changes in Task Manager for 2008 R2, such as the addition of a Services tab and the capability to launch Resource Monitor directly from the Performance tab. The Windows Server 2008 R2 Task Manager is an indispensable tool for providing an immediate view of key system operations and comes in very handy for diagnosing slow response times, system problems, or other nondescript network issues. Ctrl+Alt+Del and then select Start Task Manager. The Applications tab in Task Manager shows a list of tasks in the left column and the status of the apps in the right column. The status info allows you to determine whether an application is running and allows the admin to terminate an application which is not responding. To terminate a frozen application, highlight it and click End Task at the bottom of Task Manager. To switch applications, highlight the application and click Switch To at the bottom of the Task Manager. Finally, the Applications tab allows you to create a dump file which can be used as a point-in-time snapshot of every running process which is useful for advanced troubleshooting. Create a dump file by right-clicking on an application and select Create Dump File. The Processes tab provides a list of running processes, or Image Names, on the server. The Process Tab measures performance in simple data format. This info includes CPU utilization, memory allocated per process, and username which initiated processes. is using the most of these resources and acting as a drag on server performance. You can terminate a process by selecting the process and clicking End Process.